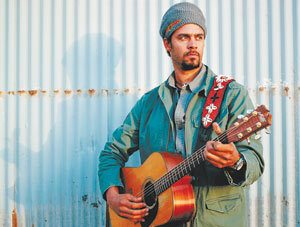 Michael Franti has finally become an “overnight success” after twenty plus years in the music business. With his new hit album “The Sound of Sunshine” and a massive tour, he is becoming a genuine celebrity, despite the face that he never wears shoes. Today - Sept. 28 - he hosts “YouTube Music Tuesday” sharing some of his favorite music videos including, Novos Baianos - Samba da Minha Terra,Little Kung Fu Yoga Boy part 4,and Say Hey Love (Dance).Click on the video here to see Michael and his favorites. Franti was also recently interviewed by Guy Raz on NPR where we reiterated that although his latest hit album is more upbeat and fun, he remains passionate about social justice, the environment and peace in the Middle East. "I think my soul is intact, but my methods of reaching people are completely different.When I first started out, I thought it was enough to make an angry song that pointed out the problems of the world. Playing on the streets of Iraq, or in Israel or the Gaza strip, I'd sing angry protest songs against war. People would say, 'Make us clap, make us dance, and laugh and sing.' It really made me think about the importance of happy music." May we all find happiness in music and every aspect of our lives, and may we spread that joy as Michael Franti is doing.